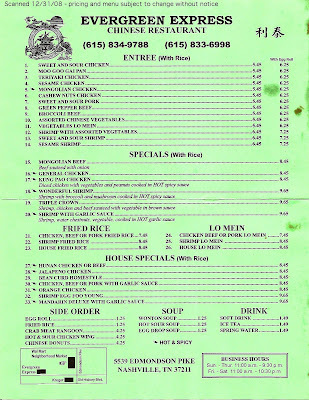 I was looking online tonight and couldn't find it... so, here's the menu for Evergreen Express Restaurant in Nashville. Click the image to the right to view it larger. Evergreen Express is a Chinese Takeout Restaurant located at the corner of Edmondson Pike and Old Hickory Blvd in Nashville, TN. thank you for posting this, i was always looking for one online too!